I usually make extra palak paneer or palak in what ever style u like & use the rest for my roties. These roties r great source of nutritions, simple and yummy in ur tummy. 1 cup cooked palak paneer. 2 cup whole wheat flour + 1/2 cup extra for rolling out the roties. enough water to make a dough I used approx 3/4 cup. 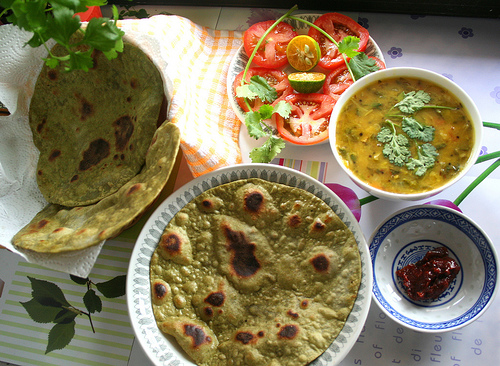 * for this roti you need not to add anything but flour & water as the rest of the ingredients are in ur cooked palak. Combine dry ingredients together, add in the cooked palak & mix adding water to make a flexible dough. The dough will be a bit sticky. Oil a bowl & leave the dough for 1/2 hour. Divide the dough to ping pong size balls & roll each one out 2 a flat roti. Heat tawa & make ur roties . Serve hot with dal & chutney. * If u like 2 make Parhatas out of them then, add 1/2 tbsp of desi ghee on each side & cook until each side is golden. Trust me I tbsp of ghee once in a while does no harm & gives a nice aroma & taste. like it .iusually cook aloo palak that's very very delicious. like it .iusually cook alo o palak that's very very delicious. Hi ! Very Healthy Roti . Palak is loaded with Calcium , Folic acid , Vit K , Vit C and Iron . Rich in fiber and Carotenoids . Protects against Heart disease , Controls Cancer , Prevents Cataracts nd Age Related Memory Loss . I crumble the paneers with my fingers while mixing it in the flour.